Synopsis : BeWarned app aids deaf and hard of hearing to detect dangerous sounds, communicate with people, make emergency calls and dance to their favorite music. The BeWarned app helps the deaf and hard of hearing to detect dangerous sounds, communicate with people, make calls in case of emergency and dance to their favorite music. One of the app's founders, who is himself hard of hearing, is sure that it will be useful for him as well as for the deaf and hard of hearing from all over the world. Vitaliy Potapchuk has wanted to create useful things for people around him ever since he was little. When he was only two years old, he lost his hearing. Ever since that time, he has found it difficult to communicate with people. Vitaliy's biggest hobby is programming; that is why he entered the Kyiv Polytechnic Institute at the age of 18 to study computer science. Right after Vitaliy finished his Master's degree, he was offered to work for the civil airway of Ukraine. While working at for the civil airway, he also developed SIMO application using the augmented reality technology. Later, he joined the BeWarned Team to develop an app for deaf and hard of hearing people. Today, Vitaliy is a Co-Founder of the startup. He is in charge of development of a bot for the deaf, a unique sound recognition engine as well as numerous other essential features of the app. According to the statistics provided by the World Health Organization, the number of deaf and hard of hearing individuals around the globe is around 400 million people, and this number is constantly growing. Every day they face difficulties in communicating with the hearing society in which they live; they don't feel safe and cannot phone their friends just to talk or seamlessly call emergency services whenever in trouble. "I love driving, but I often notice how drivers stop by my car and frown at me. Whenever they are saying something to me, I usually feel helpless: I find it difficult to explain to them that I am deaf and that I hadn't heard their cars honking or any other sounds around me", - explains Vitaliy Potapchuk, - "Being hard of hearing, the communication barrier is the biggest problem I have to deal with in my life. It is not merely my problem but also that of the whole deaf and hard of hearing community. That is why my primary goal is to eliminate it and make communication easier. So, I joined BeWarned to make it happen!" BeWarned is a single platform that unites deaf and hard of hearing people from all over the world. In 2016, we launched its large-scale beta-testing among the citizens of the USA. 88,9% of testers stated that they would recommend this app to their friends.They shared their suggestions on what other features they need in an app. "BeWarned is a real must-have for the deaf. Without it, the deaf won't be able to deal with the daily activities like shopping or meeting with friends so easily", - states Marina Epstein, Certified Deaf Interpreter, one of the first people to test BeWarned. 1. Sound Monitor detects sounds of possible danger in real-time. Should a dangerous situation arrise, our feature informs the user about it with the help of flashing lights and vibration signals. With Sound Monitor, you will always feel safe and will never have to worry about the lives of your loved ones ever again. 2. 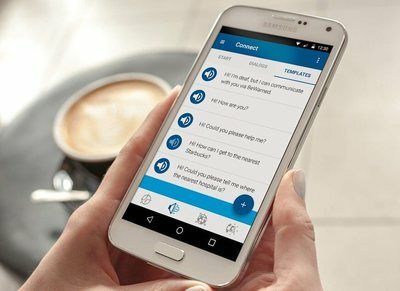 Connect helps the deaf and hard of hearing to communicate with society they live in. Users can chat to each other via special dialog and create unlimited number of templates to reach someone really fast. 3. Dance will let users enjoy their favorite tracks that are converted into vibration signals or flashing lights and feel the rhythm of the track with the help of a visual equalizer on the screen of user's smartphone. 4. Emergency Call is useful in any instance where user needs to inform his friends about an emergency situation he is in at the moment. BeWarned is a non-profit startup funded by its Co-Founders and users' donations. The app is absolutely free of charge for all the users. You can download it right now for Android and iOS. Co-Founders of the project are not only IT-geeks, passionate about state-of-the- art technologies, but also people that care about the needs of the deaf society. The BeWarned Team is aiming to unite deaf and hard of hearing people from all over the world in a single platform. BeWarned is the only unified platform for deaf and hard of hearing people from all over the world. It was founded in 2013 by Sergey Maliukov (CEO and a Founder), Vitaliy Potapchuk (Co-Founder and a Partner) and Ivan Verenych (CTO and Co- Founder). This startup is specialized in developing special software and hardware for the deaf and heard of hearing. The initial project startup is on November 16, 2016. And at the Google Play Store for Android Devices.